NEWSFLASH!!! Antwan “Big Boi” PattonAntwan “Big Boi” Patton has landed a role in “The Bobby Debarge Story”. Big will play legendary songwriter and Motown Records founder, Berry Gordy in the TV One biopic about infamous R&B singer Bobby Debarge. “The Bobby Debarge Story” will chronologize the “I Call Your Name” singer’s rise to fame with the group Switch, to his fall from grace assisted by his addiction to drugs. The oldest Debarge sibling died in 1995 at the age of 39 due to AIDS complications. Roshon Fegan (Shake It Up, Greenleaf) stars in the lead role as Bobby DeBarge with Tyra Ferrell (Boyz InThe Hood, White Men Can’t Jump) as Etterlene DeBarge, and Adrian Marcel as James DeBarge. Big Boi (Outkast) portrays legendary music mogul Berry Gordy, while singer Lloyd will appear as Switch member Gregory Williams. The movie explores the tumultuous life of the former lead singer of the 70’s R&B/Funk Band Switch, also the eldest sibling of the world-famous pop group DeBarge. Despite his success in music, the iconic falsetto found his life in peril as he struggled with fame and fortune while coping with the memories of his dysfunctional childhood. The film will debut on TV One in June 2019. 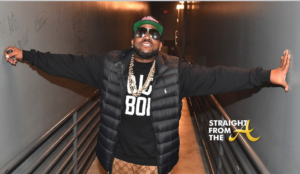 As previously reported, just hours after hitting the stage for Super Bowl 53, Big Boi announced he was taking the Dungeon Family on tour. Goodie Mob, Sleepy Brown, Organized Noize, and KP the Great are expected to join Big Boi on the 10-city tour that kicks off in Chicago this April.